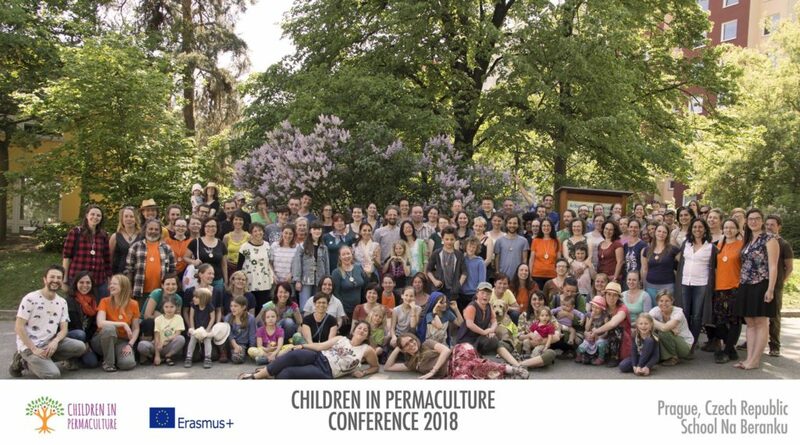 The international Children in Permaculture conference was a great celebration of a learning journey, enriching teamwork, inspiring networking and a precious seed for the future steps. This event which took place in Prague, Czech Republic 4-5 May 2018, brought together more than 150 people from different countries and fields, such as educators, school and kindergarten teachers, head teachers, permaculturists, trainers, children’s and outdoor learning NGO, families and children of course. Several Czech and international volunteers supported the conference with their active and lively contribution. All shared a dream of including children in permaculture and embedding its ethics and principles into education. The all conference reflected the importance of having the three ethics of People Care, Earth Care and Fair Share which were embedded in each of its aspects. Both the ecological centre of Toulcův dvůr and Montessori School Na Beranku, the two venues hosting the conference, offered beautiful and extensive nature while being in the middle of Prague. The first day we could enjoy the lively atmosphere of Toulcův dvůr, which is the base for several NGOs cooperating together, among them a restaurant which is a social enterprise and catered us with healthy and local food. Montessori School Na Beranku opened its doors on the second day inspiring participants with a big garden including a straw bale little house and a pond all designed and implemented by children. “Earth care, People care and Fair Share: the Children in Permaculture Manual” was launched in English and Czech languages. We celebrated a collective work in which many contributors put their knowledge and experience to create a comprehensive guide for all educators to engage children in a meaningful learning journey in nature. Thanks to the main authors Lusi Alderslowe, Gaye Amus and Denise Deshaies, the handbook is written with a deep sense of care for children, sound attention to pedagogy and vibrant curiosity. The conference was the final event of the international project Children in Permaculture funded by Erasmus+. A great occasion to showcase all the innovative resources developed in 3 years (2015-2018) including the Children in Permaculture pedagogy, case studies, films, session plans and activities. During the conference we had inspiring talks with amazing speakers, with special thanks to our keynote speakers Petr Daniš and Juliet Robertson for sharing their valuable insights. Petr Daniš, director of Czech environmental NGO TEREZA, brought in results of various research to show the importance of spending time outdoors. Do you know how much time children spend outside? Juliet Robertson showed us how to bring permaculture principles into action in the school environment. Her presentation was based on rich personal experiences, proving that with small steps, we can design any school ground into an amazing learning area, as long as we pay attention to the needs of the children. The diverse program of presentations and workshops covered a variety of topics such as creating an outdoor learning space, how to connect outdoor learning with the school curriculum. In School Na Beranku we also had the chance to see a spiral garden with plants for the bees and a clay structure that were created by hearing impaired children. All of the other presentations and workshops from participants made the rest of the conference participative, rich of opportunities for learning and networking. All the CiP team is grateful for this fruitful experience wishing to have more and more opportunities to keep engaging children and their educators in permaculture. The future is promising. More photos to be found on our Facebook DAY 1 and DAY 2.